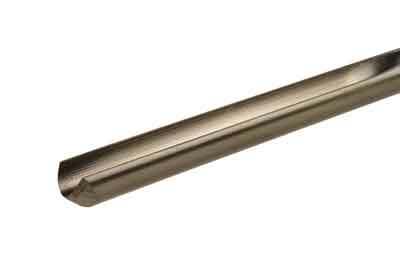 Henry Taylor is known for quality tools and also has signature tools within their range, replicating the tools and the grinds used by leading turners. A selection of tools to Mike Mahoney's specification have recently been made available to buy. Mike is known for creating beautiful hollow forms and bowls, as well as having a thorough understanding of working and cutting methodology in order to work efficiently with the least possible fuss. There are six tools in all, and although they can be bought individually, the set is as Mike uses in his workshop to create his turnings. One little extra piece of information that might be helpful: I tried three different grinding jigs to sharpen these: the Tormek, Wolverine and the Tru-grind and they could all replicate the angles on the gouges. 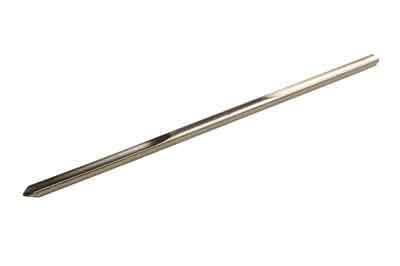 This is the workhorse of the range and is made from 20mm (3/4in) bar with a swept-back wing design. It is used as the primary tool for shaping and bulk removal of timber and is made from ASP2060 for extra edge life. 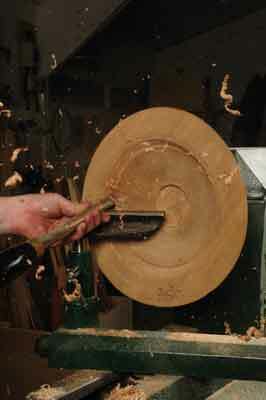 The phrase 'Woodbeater' should give an indication that this tool cuts quickly and efficiently. The 40 degree angle on the gouge allows the tool to cut efficiently with minimum effort and is easy to use. Its mass prevents it from vibrating during the fast, heavy cutting process. The ASP 2060 grade steel's edge life is reported to last considerably longer than M2 HSS - by up to 4-6 times - and this extra edge life means you can cut longer in between sharpening. It is a well-balanced tool, does what it says on the tin, and for those doing lots of shaping on their work, it is a nice gouge to use. This gouge is made from 15mm (5/8in) diameter bar and has what looks to be a long side-grind on the wings of the gouge, that is ground at quite a vertical angle in comparison to other gouges. 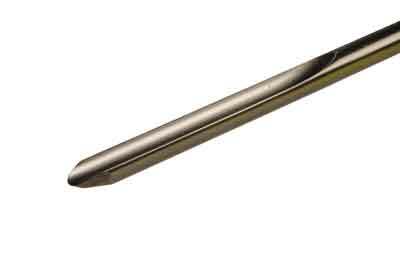 And despite its looks, this tool is used as a delicate refining tool. It can be used in bevel rub mode, or edge contact only, and is used in a shear cutting/scraping motion to remove little surface undulations, etc. It is a beefy tool which resists vibration and can be manipulated to various cutting angles to suit the wood used and cut required. In addition to this cutting method, I also found that it was great for removing timber quickly on hollow forms and vases. The blade can be presented at a skewed cutting angle which peels off the timber beautifully. It is a finely balanced tool that handles well and will, with a bit of practice, be able to create anything from a large peeling cut to the most delicate of shavings, without the need to resort to scrapers. 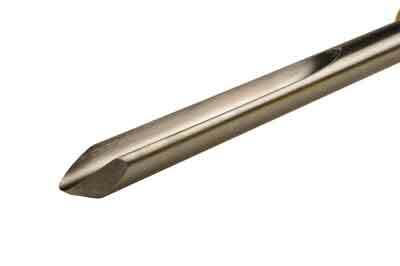 This is a bowl gouge with a very short 40 degree bevel that is designed for use around radiused curves, especially around the top third or so of a bowl. The shorter bevel - the heel is ground back - allows the gouge to gently glide around the curves where a longer bevel will create a jerky cutting action that will create ridges and not the clean curve you are looking for. It is a delicate cutting tool and is not designed for heavy-duty work, refining a shape only. It is cryogenically treated for increased edge wear. This is the gouge that is used to work the bottom half of the bowl. It has a blunt bevel angle to work around the lower section of the bowl without fouling the handle or shaft on the side wall of the work. Again, the heel is ground away to allow it to glide across curves easily. The wings are ground back about 10 degree or so, off-square. This grind type is now commonly used and it is classified as one of the most efficient grinds for this activity. 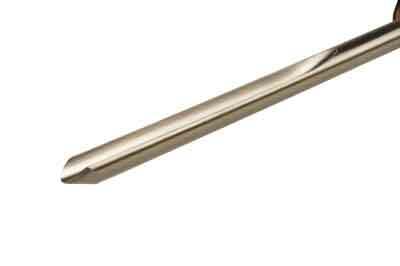 This is a 10mm (3/8in) spindle gouge with a swept-back wing design. It is designed to be used to reach where other gouges can't. This tool will cut coves, beads and other detail with ease. 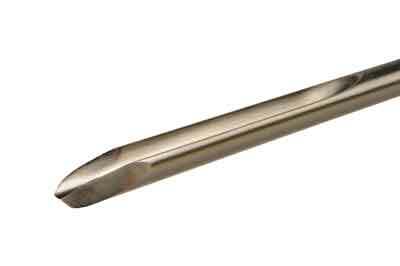 This is a double-ended gouge blade made from 10mm (3/8in) diameter bar. It has a bowl gouge one end and a spindle gouge the other. As it is designed for very light cuts with little blade projection over the rest, Mike uses it without a handle. Make your mind up whether you buy an interchangeable handle to fit this blade into. This is used to clean off spigots, cut recesses and areas of troublesome grain. It works well and is an interesting option over buying two separate gouges. The tools all work efficiently, are well made to a high standard, and do what they say they do. Watching the video clip allows you to see how Mike works with them and another video shows how he sharpens tools. The set, as mentioned, allows you to work as Mike does, but I am unsure whether anyone would buy the complete set. I think that people are more likely to cherry-pick the ones they are most likely to use. So for me, the strength of this set is one of choice. 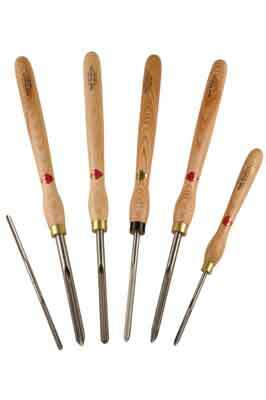 I don't believe that one tool can do everything well, and I too have a range of gouges ground for different purposes. So, these tools may prove to be a solution to some of the problems or sticky situations you are currently encountering.